This show is labeled as a “Love comedy” with a ridiculous premise of a high school boy, Hayate, whose parents rack up 150,000,000 yen of debt and then desert their son, leaving him to fend off the “とても親切な人たち” (Very Nice People) debt collectors… i.e. the yakuza trying to harvest and sell his organs. While running away, he meets a hot headed little rich girl, Nagi Sanzenin, alone in a park. While scheming a plan to kidnap and ransom her, he witnesses real kidnappers trying to capture Nagi and can’t resist chasing them off. Nagi, unware of Hayate’s plans, thanks him for saving her. As repayment, Hayate tells Nagi he wants her to “Go with him” and he “wants” her (for ransom). Nagi, of course, misunderstands and thinks he is professing his love to her. Eventually, Nagi does get kidnapped by the real bad guys and Hayate sets off to rescue her. He grabs a bycicle and catches up to the kidnappers’ speeding car. Yes, he’s that fast XD He also gets hit by said car and still beats the kidnappers (he trains a lot, after all). Soon after rescuing her, Hayate collapses and Nagi decides that as repayment he will be her new butler! Thus all the fun antics begin. Hayate no Gotoku really is a fun show. While it’s supposed to be a love comedy, it’s much more comedy than romance, though the romance parts are there. 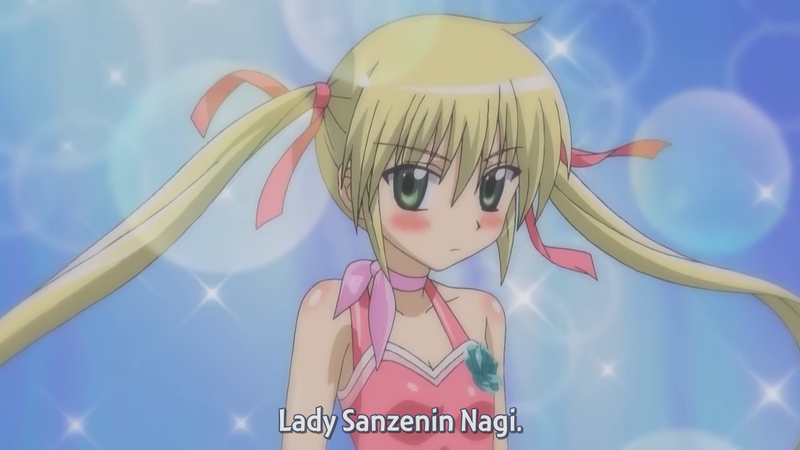 You just get teased by short, cute scenes between Hayate and Nagi throughout the show. The main characters are quite likeable and even the side characters are appealing. Nagi’s tsundere tendencies make for many kawaii moments. She is also voiced by Rie Kugimiya, a master of the tsundere character type. The narrator (Norio Wakamoto) is absolutely hilarious. Often the characters realize the story is being narrated and sometimes even interact with the narrator. This is the guy that does the Emperor in Code Geass, so of course, the narrator speaks in an over the top, dramatized accent. It really adds to the comic appeal of the series. In the end, this is a great series and I am looking forward to the sequel. One of the things I wished for in this series was more progression between Nagi and Hayate’s relationship so maybe we will get to see that in the upcoming series. They have no trouble making fun of popular TV shows, other anime, and even itself. You will get some good laughs out of this series, that’s for sure. Final Verdict: If you like cute, romantic comedy, you will like this show. Do yourself a favor a give it a try.